Artisan Bread in Five Minutes a Day is the best thing that has happened to my bread baking and my comfort food cravings. Rough day at work? Spend a few minutes preheating the oven and shaping the dough and fresh baked bread, hot enough to melt butter on contact is yours. Unfortunately, because of the ease of the whole process, Artisan Bread in Five Minutes a Day is not the best thing that has happened to my waistline. C'est la vie. My latest artisan dough of choice is the light whole wheat bread. It's turned out to be quite the gateway dough for whole wheat breads as I now have a batch of their full force whole wheat bread in the fridge waiting for its first use. The light whole wheat dough is perfect for flatbread. I discovered this when I was looking for something small to serve before a dinner that was taking longer than expected to finish. I also had the last of my homemade goat cheese to use up. While the dough rested, I whipped up a half batch of these caramelized onions and with the toppings finished, appetizers were jut about served. This dough also works really well for dinner rolls. Be sure to save some of the caramelized onions from the flatbread to use as a topping for the rolls. Delicious. Just remember to re-read the first paragraph and consider yourself forewarned if your pants start to fit a little snug. Combine the water, yeast and salt in a 4 - 6 quart container. Mix in the flour and cover the container loosely. Let the dough rise for two hours. The dough can be used immediately or stored in the fridge until you're ready to use. Sprinkle the dough with flour and pull off a fistful of dough (about a pound) and form into a ball. Stretch the surface of the dough around to the bottom on all four sides, rotating the ball a quarter turn as you go. Let rest on a floured work surface for 20 minutes. Preheat the oven to 450*. Roll or stretch the dough out into a long oval. Top with caramelized onions, goat cheese, herbs or any desired toppings. Slip the flatbread onto a baking stone in your preheated oven and bake for around 30 minutes (start checking after 20 minutes as there are a lot of variables - toppings used, amount of dough - that can change the baking time). Sprinkle the dough with flour and pull off a fistful of dough (about a pound). Form the dough into a ball and stretch the surface around to the bottom on all four sides, rotating the ball a quarter turn as you go. Let rest on a floured work surface for 20 minutes. Divide the ball into six equal portions and form into smooth balls. Let rest again on a floured surface for 40 minutes. Preheat oven to 450*. Dust each roll with flour and slash an x on the top. Place one tablespoon of caramelized onions in the indentation the x leaves. Bake the rolls for 20 - 25 minutes. If you have a broiler tray, pour 1 cup of water into it after you put the rolls in the oven to create steam to help with forming a crust. One of these days I am going to buy this book I am reading so much about. These look absolutely delicious. Definitely comfort food! 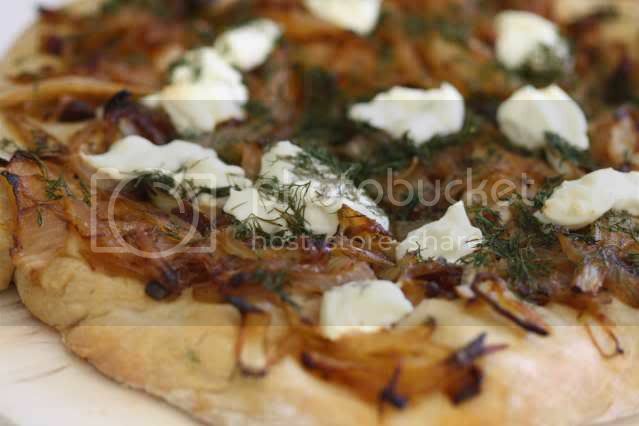 Caramelized onions and goat cheese are one of my all time favorite flavor combinations! I usually make them into a tart, but this looks wonderful. Delicious & so yummie! Great food! Looks fabulous, and easy, too! Love fresh, homemade bread... that reminds me, I should feed my starter. This looks so easy to do. All I need to buy is the yeast-thanks! Both flatbreads and dinner rolls look fabulous! Wow, it really is that simple, really? Your photos are fabulous, and thank you for sharing this recipe! I am just starting to get somewhat comfortable with the idea of making bread at home. Thank you for providing inspiration! Artisan Bread in Five Minutes a Day has revolutionized our "bread habit" too! I have always loved to bake bread, but I did it more for special occasions. Now, with the dough in the fridge it becomes a quick snack or a lunch! Your caramelized onions and goat cheese topping looks fabulous. 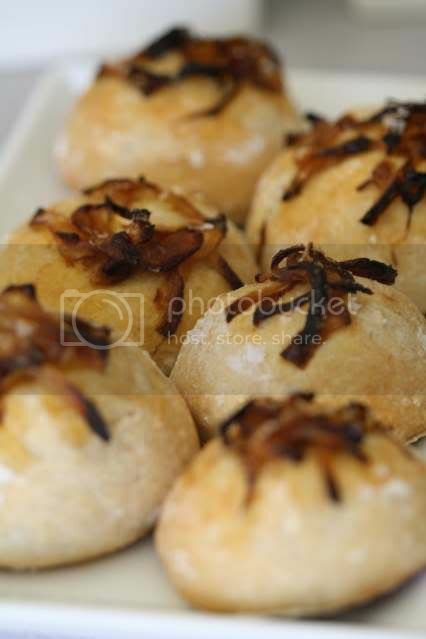 I love the caramelized onions you put on top of the dinner rolls - they look so yummy! This looks fabulous. Nothing beats the aroma of homemade bread. What a great combinations of flavours you put together on that flatbread! I would walk miles to have a try of that! Nothing beats homemade bread! Love the flavours on the flat bread! MMMMMM.....hot homemade bread, goat cheese, and carmalized onion! Oh my now I am hungry! Looks beautiful too! I made your Buratta Sundae as an amuse bouche for a dinner...and put it up on my site. It was the hit of the night, and I thank you v. much--it will be a staple in our house. I found my 11 year old daughter serving herself a (giant) scoop of buratta and slathering it with balsamic glaze for her after-school snack! I just posted about my love for ABin5 too and OMG you're taunting me with that homemade goat cheese! Looks so good! I keep saying I need to check out that book but haven't yet. One of these days. Your dinner rolls look delicious! Such a great combination of flavors...just love it! The pictures are very nice. I totally know what you mean about bread baking being a good stress-reliever at the end of a hard day. My baking is usually more of the quickbread variety, but kneading some dough is great for agression! I love bread baking but have not yet been converted to the Five Minutes A Day. But I want to be. Hoping to get the book for my birthday...your rolls just put me over the top! I think this book is gong to help me get over my fear of making bread because here is yet another recipe from it that looks fantastic. I love anything with caramelized onions, especially when bread is involved! Delicious. Flat breads are a weakness of mine. Many a times it ends up being my whole dinner. Thanks for the new recipe to add to my addiction.